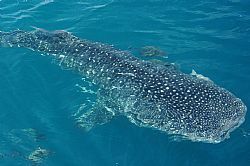 See a whale shark in the Gulf? Call Mote Marine Lab immediately! Please report any whale shark sightings in the Gulf of Mexico immediately from your boat or just after disembarking, within 24 hours at most, to Dr. Bob Hueter at Mote’s Center for Shark Research: 941-302-0976. Please note the number of whale sharks spotted, the date, time, location and exact GPS coordinates if possible. “It’s exciting that we are hearing reports of five whale sharks in one area, because it suggests they might be feeding on something in a special spot,” said Dr. Bob Hueter, Senior Scientist and Director of the Center for Shark Research at Mote. If others are reported in the Gulf, Hueter and partners want to attach a special type of satellite tag to one or more of these gentle giants, to collect data on their geographic location and the temperatures and depths they encounter over a six-month period. This tag trails behind the shark’s first dorsal fin on a short tether and, whenever the shark is at the surface, the tag transmits precise location data. Retrieving the tag will yield extensive data, but if it cannot be recovered, the scientists will still receive real-time GPS signals from the tag, revealing where the shark is traveling, along with other summarized data on depth and temperature.